There are two ways to add users to the Velpic platform; manually, or via an import. In the dialog enter the details for the new user. Select the user role, either "Trainee", "Admin" or both. By default "Trainee" is selected. There are currently four user roles in the Velpic system. Admin: this user type has access to the administrator area and all admin privileges, e.g. Managing groups, importing users, scheduling lessons etc. They do not, however, have the ability to view lessons or have scheduled assigned to them. Trainee: the trainee user type should be selected for all users who need lessons scheduled to them, and are expected to view content from the Velpic platform. These users do not have the ability to perform administrative tasks. 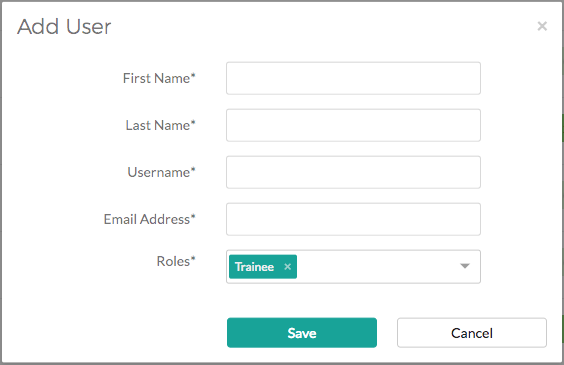 If an admin user needs to watch lessons within the Velpic platform, they will also need to have the "Trainee" user role set.